Proportional gate increases packaging efficiency and eliminates breakage. HEAT and Control 's has released the Revolution proportional gate for FastBack conveyors. 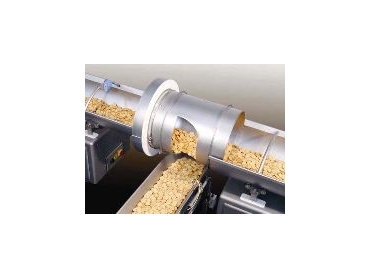 It allows the distribution of proportional quantities of baked products and snacks to multiple weighers, seasoning systems and other equipment without interrupting the main product supply. Its revolving discharge gate modulates to deliver precise amounts of product to two conveyors. Downstream equipment does not have to wait for product. Product breakage is eliminated because there are no pinch points to cause product damage or personal injury. The leak-proof design reduces concerns about allergen or cross product contamination. The system uses no maintenance-intensive pneumatics or solenoids.